Low serum formulations (below) are available for the above listed species in 40 ml or bulk quantities; Serum-free formulations are available for Human, Non-Human Primate and Mouse cells only. Use HemoGro™-LS or HemoGro™-HPSF for controls (no growth factors). For research use only. Not for clinical diagnostic use. This catalog numbers are for Human cells / Low serum formulation; available as well for Primate, Canine, Rat or Mouse. 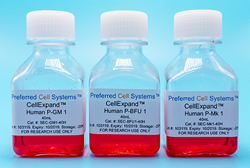 Serum-free formulations are available for Human, Primate and Mouse cells.